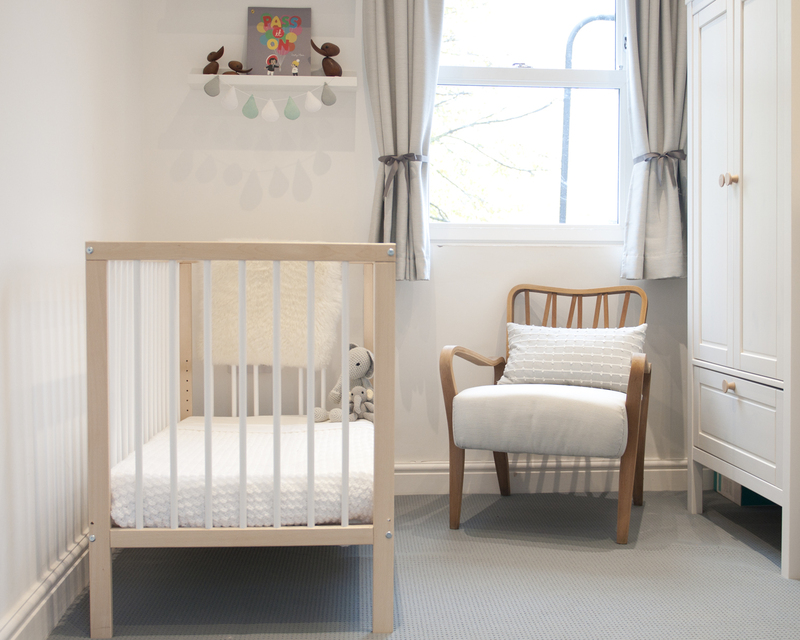 but it's nursery was looking incredibly bare and un-baby-friendly so we relented. Having said this, the baby's room isn't tiny but it's definitely a single room so we wanted a cot that wouldn't hog the space, and, as we've already got a 0-6 months solution I didn't want to choose one that would need upgrading as soon as the little one is ready for the next step. We were looking for something simple, inexpensive and most importantly, compact. Mokee had it nailed (or rather, alan keyed). Once it was up, its benefits beyond marking the territory as baby's room became clear, I'll be able to pop the baby in the cot post-nappy-change or if I need to be hands free in it's nursery for anything, this will also mean that the baby will be familiar with it from birth so the progression from Snüzpod to cot won't be such a shock. 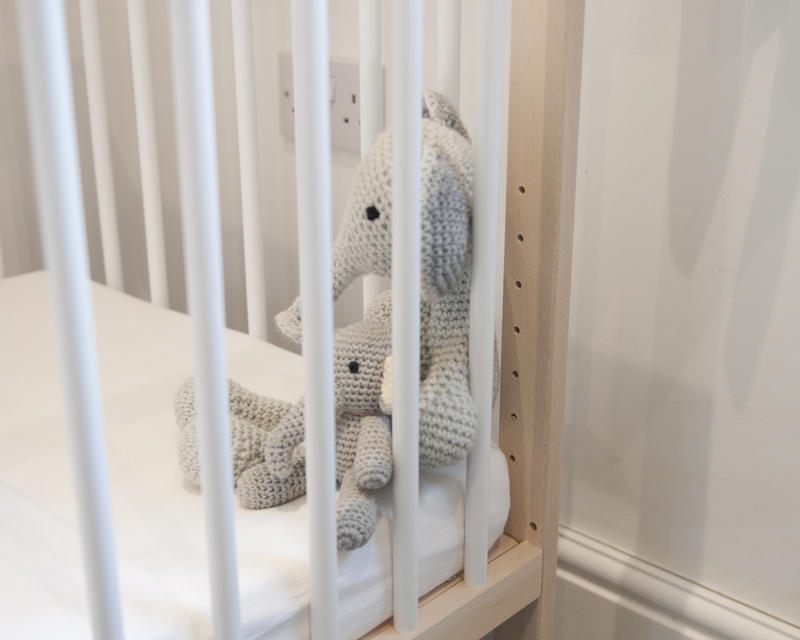 And if it grows super long limbs and out-grows the bedside crib quickly it will fit into our room easily. The versatility of this simple solution is its calling card. Let's talk about size. It takes a 120 x 60 mattress, standard for most other cots on the market. So what sets it apart? Longevity. It transforms into a cot-bed (or sofa-bed) with the simple removal of a side panel and the addition of an extra slat. 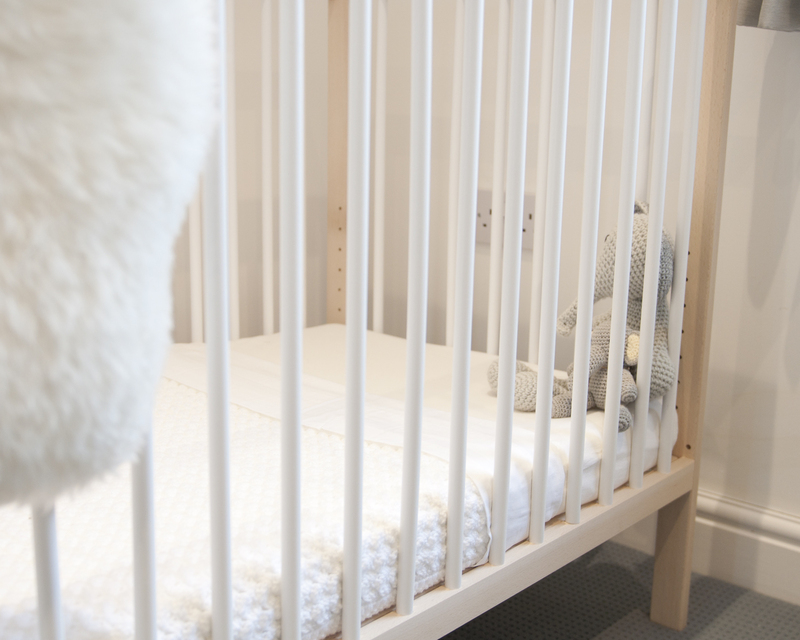 Most cot-beds are 140 x 70, and other cots of the Mokee-mini size just don't offer this feature so it would mean trading it in for yet another model. Knowing that it's going to last us until the mini is up to three years old without taking up any more space in the room is great. And another thing: Eight adjustable heights mean that you can lower the base as the baby becomes more mobile...and nimble. We've left it on the lowest setting for now. Just incase. It was very easy to put together, two supplied alan keys and one husband got it together in about 15 minutes. I could have done it on my own but I chose to be in charge of instructions, by which I mean I uploaded the 'making-of' to Instagram stories while he twirled those alan keys. Needless to say he didn't need my instructions-although I did chip in every now and again to confuse matters-it was as simple to put together as it looks. 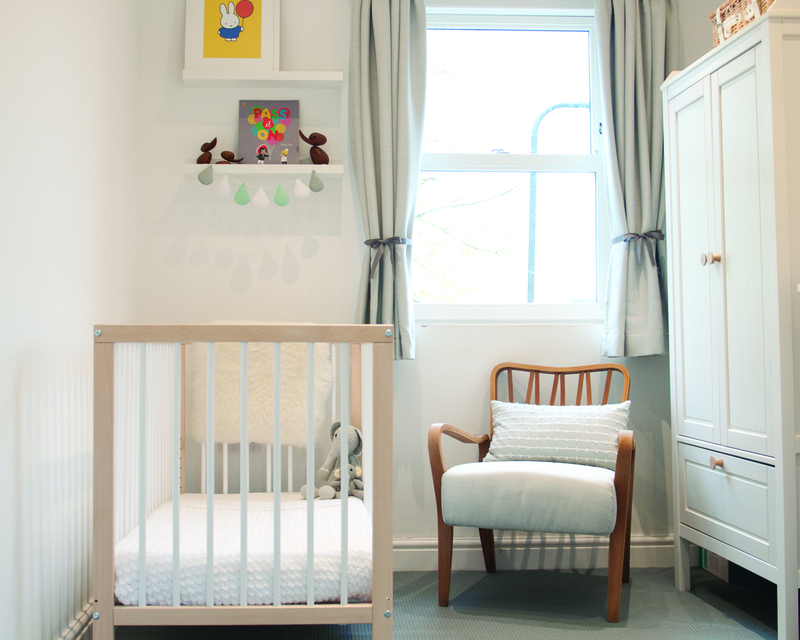 The white and beech was an obvious choice for us, the simple wood-and-white scheme has been evolving in our nursery since I changed the knobs on the ikea wardrobe and drawers for some beech eBay bargains. 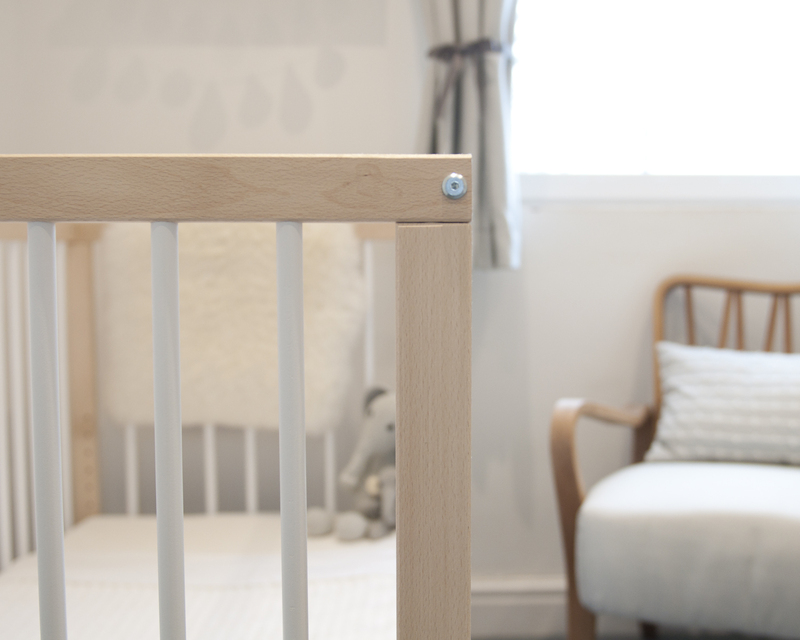 I love the calming feel of this cot and hope that baby will find it very restful too. The only extra that we have is the aloe vera mattress, which has a good firmness and feels soft and gentle. There are a few extras available for the cot that are worth mentioning: an under-cot drawer can be added for extra storage. We chose to go without this as we have quite a lot of storage in the room already but it's good to know that we can add it on at any time. 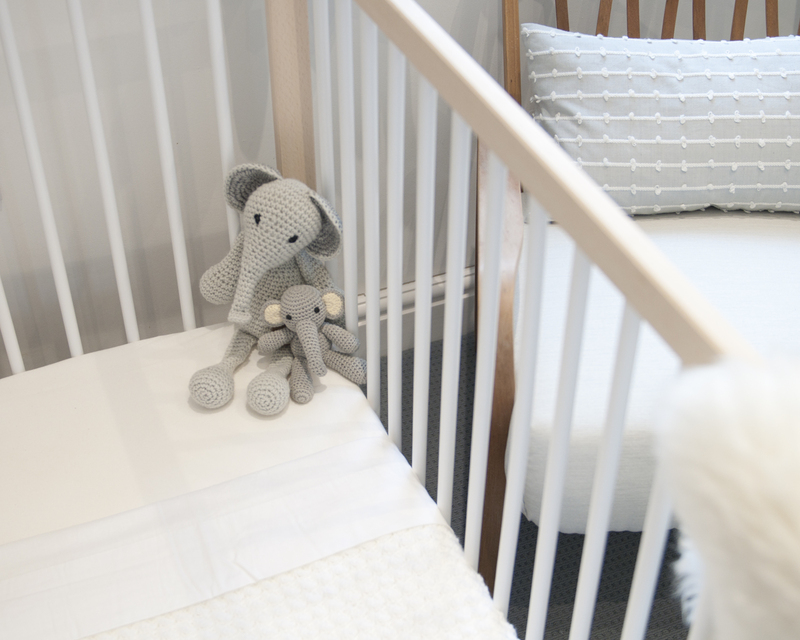 The cot is really light, I can move it on my own so if I fancy changing it up, and I do, often, it's easy to shimmy it around the room but there is the option of castors to make a moving it extra-easy. If we do end up using it in our bedroom I'll definitely be adding these so that I can wheel it back and forth into the nursery for daytime naps. The Mokee mini in beech is £79.95 and the aloe vera mattress is £29.95 when ordered together. Visit the Mokee website to check out the other colours too. The sheepskin is from Ikea, the large elephant was made by my mum from this pattern book, the small elephant is from Meminio. And you can read about the chair re-vamp here!